Cherry Americas LLC, part of a leading global manufacturer of reliable computer input devices, has been awarded the 2017 Homeland Security Platinum Award for their complete line of secure CHERRY Smart Card reading devices. 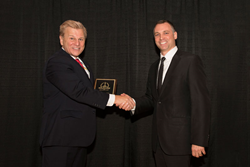 Phillip Kirsch, General Manager, Cherry Americas LLC, receives a Platinum Award for the 2017 Homeland Security Awards from Michael Madsen, publisher of American Security Today. We’re honored to have had our broad line of reliable Smart Card keyboards and readers chosen for this prestigious award. 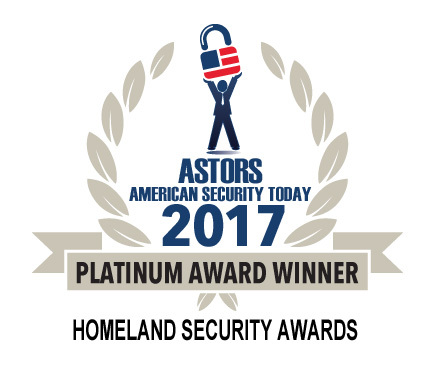 The prestigious Homeland Security Awards Program was sponsored by American Security Today (AST) magazine, and is regarded as the most comprehensive awards program in the security industry. This awards program was organized by AST to recognize the most distinguished security vendors, as the nation continues to respond to escalating threats from home and abroad. The innovative solutions being implemented to meet those threats has led to tremendous growth in the field of Homeland Security, and to this awards program for recocognition of the key contributors to our nation’s security. CHERRY has received the highest honor in the Smart Card category with the Platinum award. The judges for the competition consider the technical innovation of entry products and their overall benefit. Cherry’s Smart Card readers were evaluated for their overall features, interoperability, design, quality of the products, and their efficiency to increase public safety and national security. “We’re honored to have had our broad line of reliable Smart Card keyboards and readers chosen for this prestigious award,” stated Phillip Kirsch, General Manager of Cherry Americas LLC. The CHERRY JK-A0100EU and JK-A0104EU Smart Card keyboards were designed for maximum use in maintaining a secure user base. These wired keyboards offer secondary authentication of a Smart Card before allowing access to the connected system. In addition to the smart-chipset card reader, the keyboards support secure PIN entry. The PC/SC Smart Card reader is CCID and EMV Level 1 approved, and is also compatible with reading and writing ISO 7816-compliant smart cards. These FIPS 201 certified keyboards feature the classic CHERRY office “touch and feel” tactile quality for efficiency and ease of use. The CHERRY ST-1144 is a standalone USB Smart Card reader designed for heavy use. The FIPS 201 and CAC certified ST-1144 features a heavy weighted base which provides stability for one-hand operation. The CHERRY JT-0100WB contact reader and its contactless (JT-0200WB) and combination (JT-0300WB) partners, offer secure local access in a portable package. For more information on the award-winning CHERRY Keyboards and Card Readers, please visit http://cherryamericas.com/product-category/integrated-security/, or contact Cherry Americas LLC, 11200 88th Avenue, Pleasant Prairie, WI 53158. Phone: 800-510-1689. Cherry Americas LLC, with its headquarters in Pleasant Prairie, Wisconsin, USA, is part of a global leader in manufacturing of computer input devices with a focus on POS, desktop, industrial, healthcare, and IT security markets. CHERRY leads in the manufacturing of switches used in mechanical keyboards for markets such as performance PC gaming.